This plugin adds another option to the top menu site setting, which gives you a new tab labelled “Unseen”. It is an exact replica of the “Latest” tab, but only shows the unread topics. There are no site settings to enable/disable this plugin. 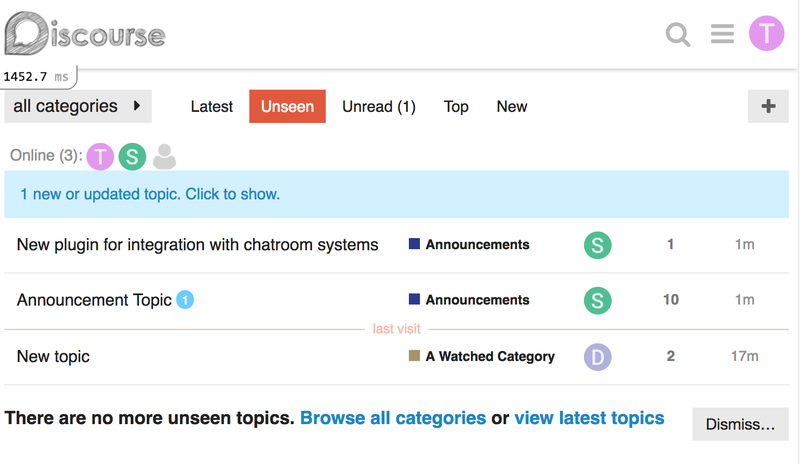 You simply install it, then add “Unseen” to your top menu site setting. “Unseen” is not a great title, but it needed to be something different to “Unread”. 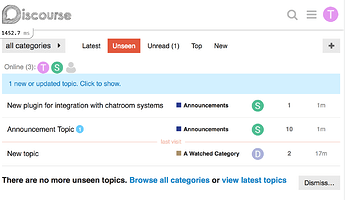 On my forum, we have renamed the existing “Unread” page to “Tracked”, and then renamed “Unseen” to “Unread”. How is this different from the existing new/unread tabs? New replies, to topics you have already viewed at least once, and are tracking. Even if you are tracking a category, the topic will not show up in “Unread” unless you have opened it at least once. Since migrating from phpBB, some of our users have complained that the Unread tab’s behaviour is very different from what it used to be. This looks like it could make it do what they expect. Thank you for making it! How did you go about this? Can you just do it through the admin text content interface? Can you just do it through the admin text content interface? This looks really useful David, but after installing it is not showing up in top menu, I do see it’s installed under plugins, any ideas? I can confirm “unseen” is not an option in the top menu setting. I’d guess the plugin needs to add itself to the choices list. It would also be good if it could add itself to the user’s Preferences→Interface→Default Home Page (and in a way which can be renamed through text content).